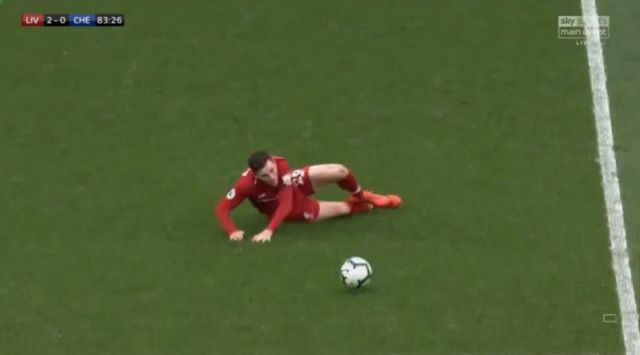 With the Reds sitting pretty at 2-0 in the second half, Andy Robertson – usually so assured on the ball – lost his footing and slipped at a vital moment. We all thought the same thing, obviously. There were slight echoes of that day five years ago, but they faded quickly in the din of Anfield. Chelsea took possession, but thankfully nothing came of it. Jürgen Klopp, however, found it ironic considering how much noise there has been about Gerrard’s slip and the context of this game. He turned around smiling at first, looked at the crowd, and celebrated wildly in front of the Anfield faithful. Is it happening again?! Not this time. Robertson slips over in his own half gifting possession to Chelsea, but it’s wasted by Eden Hazard. Klopp then goes ballistic on the touchline.